At Lighthouse Outdoor Lighting, we typically do not recommend sconce or carriage lights around an entryway. In fact, we generally try to help clients understand that due to excessively high glare around stairs and steps, decorative lighting fixtures can be dangerous. We specialize in reflective lighting rather than open filament lamps. 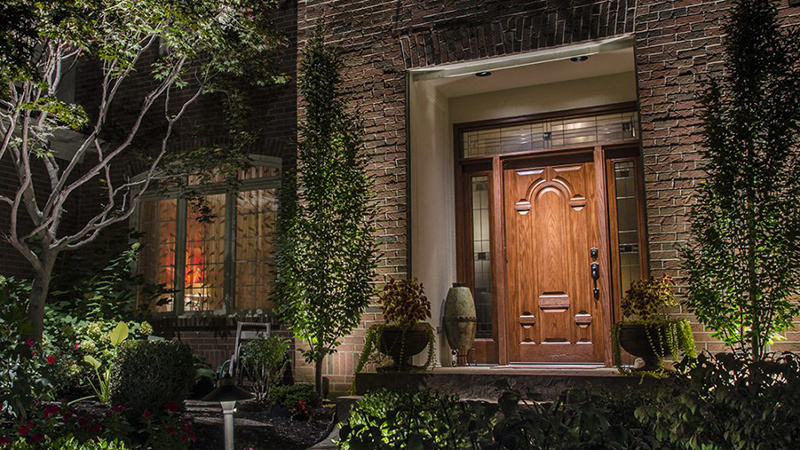 Reflective lighting is the light that echoes off walls, plants, hardscaping or your home. It is essential to the beauty of any landscape lighting design. Our designers know how to properly illuminate a space without these problem-causing fixtures. We utilize architectural lighting, accenting lighting, and moonlighting to ensure the best design and highest standard of safety. If a client desires a look with lighting fixtures at their front entrance, we advocate for sconces that have the light source fully concealed. Finding a lighting fixture that does the job while looking aesthetically pleasing is no easy task. There are many variables to take into consideration. We’ve listed some of the most important below. It’s easier, and often less expensive, to purchase lighting from a collection. A good collection will offer a range of fixtures featuring the same design style and finish. Ensuring good lighting along paths, stairs, at all entry points, and around shrubbery or other potential hiding places increases the safety of your family and guests and the security of your home. Can you easily reach the fixtures to change bulbs, clean the glass, or polish the metal? A light fixture’s UL dampness rating will determine its safe placement. A lighting fixture should complement the architectural style of your home. At the very least, it shouldn’t clash! For instance, an Arts & Crafts style fixture would look out of place on a Victorian Painted Lady. It’s also important to remember that lights usually appear smaller and less in scale from the street. Which means that choosing the correct fixture for your space can be difficult without the proper knowledge and training. Whichever style you choose though, a photocell that automatically turns the light on at dusk and off at dawn will save on your energy costs. Good exterior lighting is particularly important during the increasing hours of deep gloom in the fall and winter. Especially when it comes to front entry lighting and walkways. Poor lighting and slippery steps are a dangerous combination! 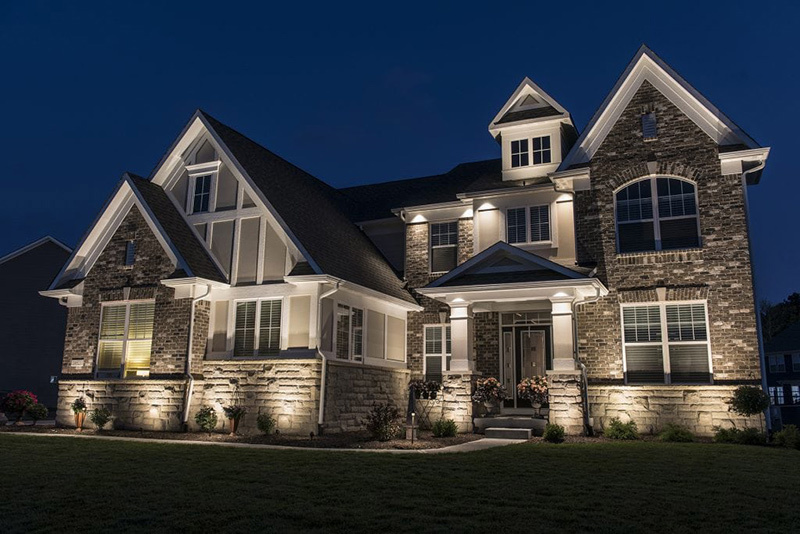 Our lighting design experts at Lighthouse Outdoor Lighting recommend creating a robust lighting design that illuminates more than any one sconce or mounted light can create. 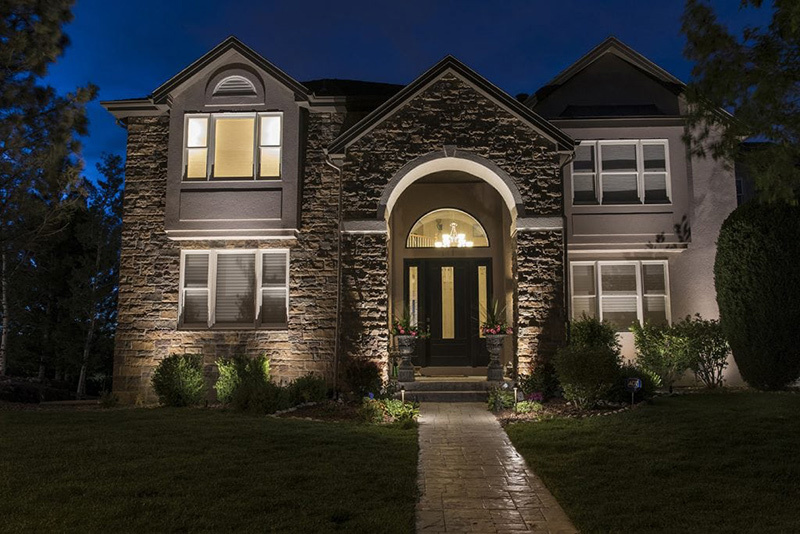 To acquire safety, security, and beauty from a lighting design you will need to shine a light on more than just your front door. But, if you choose to use a bulky lighting fixture you can estimate the total wattage you’ll need for a space by multiplying 1.5 times the length by the width of the area (1.5 x length x width). Divide that number by 4 if you’re using LEDs. 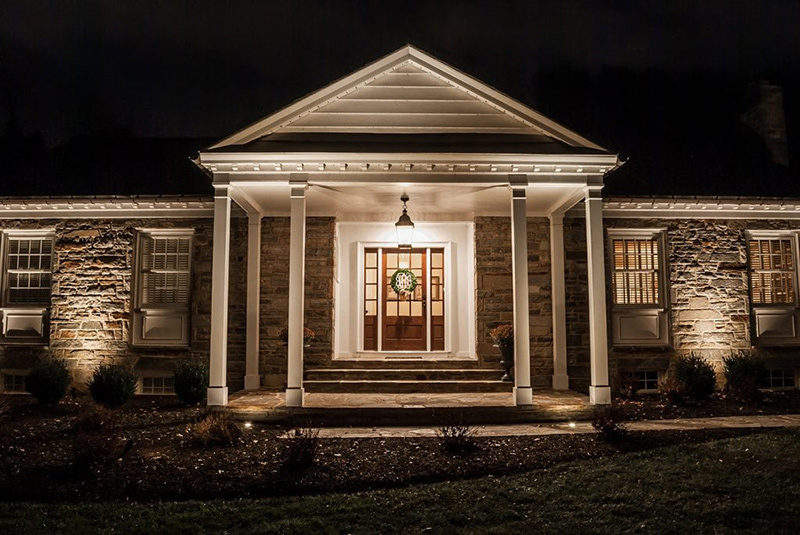 There are many things to consider before illuminating your front entrance. Fortunately, at Lighthouse Outdoor Lighting, we have the experience and resources needed to tackle the design and installation of any outdoor lighting project.